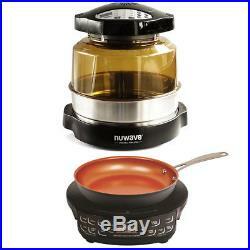 NuWave Pro Plus Oven with 3 Extender Ring Kit and PIC Gold Cooktop with Fry Pan. Brand New in Original Packaging. NuWave Pro Plus Oven (Black) with 3 Extender Ring Kit. NuWave PIC Gold Precision Induction Cooktop with 10.5 Hard Anodized Fry Pan. NuWave Oven Pro Plus. 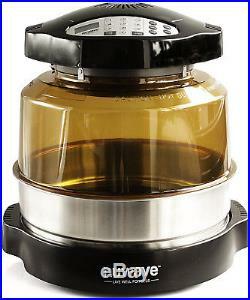 NuWave Oven Pro Plus Extender Ring Kit. 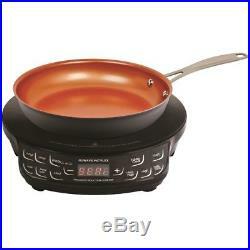 NuWave PIC Gold Precision Induction Cooktop with 10.5 Fry Pan. The NuWave Pro Plus Oven with 3 Extender Ring is a countertop appliance that quickly cooks a variety of foods. It’s a domed oven that uses conduction, convection and infrared cooking technology to easily cook meats, poultry, fish, vegetables and other foods. This cooker takes 75% less energy and can cook meals 70% faster than a standard oven. The oven can barbecue, roast, grill, bake, broil, dehydrate, steam and air fry foods for up to 10 hours straight. It can even handle a 16 pound turkey or a 14 pound ham. The appliance features settings for warm, reheat and delay. You choose whether to cook with pre-set temperatures or adjust the temperatures, in one degree intervals between 100 and 350 degrees Fahrenheit, using the exterior digital panel. No preheating or thawing required! This oven features an upgraded amber Polyetherimide dome, a black base, a digital panel, two cooking racks (one is reversible), a porcelain enamel liner pan and a 3-inch stainless steel extender ring for extra capacity. It’s lightweight and portable, allowing you to use it in an RV, a dorm room, a boat or as a secondary oven when you’re doing heavy cooking. Everything is dishwasher safe except for the digital panel head. The NuWave Pro Plus — As Seen on TV — will change the way you cook. The included 3 extender ring is designed exclusively for the NuWave Oven Pro Plus. It’s constructed with stainless steel and can increase the oven’s capacity by as much as 50%. It makes the oven big enough to cook a 16-pound turkey (it normally can only handle a 10-pound bird) or a 14-pound ham. Touch N’ Go Control Panel. The Oven Pro Plus is a smart countertop oven with intuitive controls and professional results. Select the cooking temperature, time and then press start. No need to preheat or defrost; this oven is as simple as it gets. Three technologies combine to make the NuWave Pro Plus Oven an amazing countertop cooker. This oven uses infrared cooking, conduction and convection to quickly and easily cook meats, poultry, fish, vegetables and more. Barbecue, roast, grill, bake, broil, dehydrate, steam or air fry foods with this oven, and cook for up to 10 hours at a time. You can even cook a 16-pound turkey or a 14-pound ham. This domed oven cooks up to 70% faster than a standard oven while taking 75% less energy. It doesn’t require defrosting your meals or preheating the oven before cooking. Multiple Settings and Temperatures. There are “warm”, “reheat” and “delay” settings, offering a customizable experience to cook whenever, and however long, you want. The default setting cooks your food at 155 degrees Fahrenheit for 2 hours, but your options range between 100 and 350 degrees, allowing you to set your temperature with precision. The NuWave Oven is RoHS compliant, meaning the materials and toxicological profiles contain a concentration of less than 0.1% of dangerous toxic chemicals such as lead, mercury and cadmium. Also, the oven was tested by a third party laboratory to release up to 250% more fat drippings than conventional ovens. Cook your meal worry-free and reduce your fat and oil intake. The Oven Pro Plus even reduces the carcinogens that cause cancer, because it cooks at lower temperatures than conventional ovens and gas grills. Intuitive Touch N’ Go digital controls with results of a pro chef. Preheating or defrosting is never necessary. 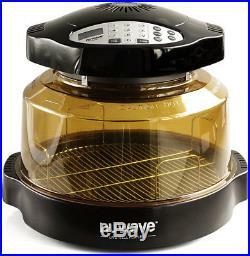 Bake, broil, roast, grill, steam, dehydrate, barbecue and air-fry. Cooks variety of meats and vegetables, even 16 lb. Infrared, conduction and convection “Triple Combo Cooking”. “Warm”, “Reheat” and “Delay” settings to fit your needs. Precise temperature control in 1° increments from 100 to 350°F. Better and more even results than microwave. 75% less energy and 70% faster cooking than a standard oven. Dishwasher safe with 3 stainless steel ring for added capacity. NuWave Oven Pro Plus (Black). NuWave’s Precision Induction Cooktop (PIC) Gold offers precise temperature control with the simple press of a button. You can adjust the cooking temperature in 10° increments between 100°F and 575°F (Sear) for a total of 52 precise temperature settings. The PIC’s induction technology heats the cookware directly, not the surrounding area, making it incredibly safe. With no open flame or hot coil, there is virtually risk of fire. Utilizing 1500 watts of power, the lightweight and portable PIC allows you to cook gourmet meals virtually anywhere. It even offers state-of-the-art programming technology with 100 hours of memory that allow you to program your favorite cooking procedures. A 10.5 Hard Anodized Duralon Healthy Ceramic Non-Stick Fry Pan is included. This versatile pan is the perfect complement to the NuWave PIC Gold, allowing you to cook your favorite foods without adding any unhealthy fat or oil. Cook Faster and Smarter. With an expansive temperature range, adjustable in 10-degree increments, the 1500-watt NuWave Precision Induction Cooktop Gold (PIC Gold) can cook as low as 100°F and as high as 575°F. The PIC Gold has three different wattage settings, so you can cook at 600, 900, or at the full 1500 watts. The portable 1500-watt PIC Gold features 100 hours of memory that allows you to program your favorite cooking procedures, as well as a Delay function that allows you to initiate cooking when it is most convenient for you. Additionally, the PIC Gold boasts a delayed shutoff feature for added convenience and an expanded 8-inch induction heating area for added cooking versatility. 52 temperature settings in 10-degree increments. Expansive temperature range between 100°F and 575°F. Set to 600, 900 or 1500 watts with variable wattage control. 100 hours of memory, Delay and Sear functions for versatility. Know precise temperature you’re cooking at within 5 degrees. Control your cooking oil temperature perfectly. Includes 10.5 hard anodized fry pan. NuWave PIC Gold Precision Induction Cooktop. 10.5 Hard Anodized Duralon Healthy Ceramic Non-Stick Fry Pan. Quick and Easy Cooking Guide. In the Continental US Lower 48 states only. We cannot declare items at a lesser value or as gifts. Territories and International orders. F There are product categories which are not returnable due to hygienic or sanitary as required by manufacturers. In an event where there is an error regarding a price error or description, we will notify you ASAP. Items removed from their’blister-pack’ display packaging are non-refundable. The item “NuWave Pro Plus Oven with 3 Extender Ring Kit and PIC Gold Cooktop with Fry Pan” is in sale since Wednesday, March 7, 2018. This item is in the category “Home & Garden\Major Appliances\Ranges & Cooking Appliances\Cooktops”. The seller is “asavings” and is located in Brooklyn, New York. This item can be shipped to United States.